Because he could not come to a contract extension with the Memphis Grizzlies, Rudy Gay will now become a member of the much anticipated 2010 offseason free agent shopping spree. Gay was looking for a contract in the range of the 5 year – $65 million extension that Portland gave Lamarcus Aldridge. Apparently, Memphis didn’t agree he was worth that high of an extension. Was this a good move for Gay or the Grizzlies? Gay, by turning down Memphis’ best deal, obviously hopes to cash in on the much hyped free agent frenzy of next summer, when as many as 8-10 teams have been stockpiling cash in hopes of landing one of the “big fish”. Could Gay and his agent have overvalued his talents? In my opinion, Rudy would probably be in the third tier of players available next summer. He obviously is not on the top tier, which includes LeBron, Wade, and Bosh. He isn’t even in the category of the next best grouping of possible game changers like Nowitzki, Ming, or Joe Johnson. He probably fits in the third group of available players who are more complimentary like Michael Redd. I don’t even think that Gay is of the same caliber of Rajon Rondo, who just resigned for five years and $55 million in Boston. As for his comparison to Aldridge? Although they are different types of players, their offensive numbers are very similar. Both have averaged around 17 ppg for their careers with Aldridge averaging almost 8 rebounds to go with the scoring. While Gay has probably become the Grizzlies’ #1 scoring option, Aldridge plays second fiddle to Brandon Roy in Portland. There is always a sense of uncertainty about how good a player really is when they are the high scorer on a bad team. I’m sure the Knicks are kicking themselves now for trading their top two selections in the ’06 and ’07 NBA Draft to the Chicago Bulls in 2005 for the rights to Eddy Curry, Antonio Davis, and what would become Wilson Chandler. Those two picks turned out to be Aldridge (’06) and Noah (’07). Even though Chicago would send Aldridge to Portland, their consolation prize would have been Tyrus Thomas. Rudy Gay also switched teams before setting foot in an NBA arena. 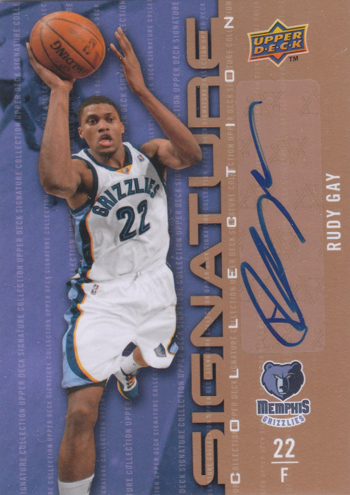 Houston, who traded Gay to Memphis for Shane Battier, sure could use a promising player like Rudy right now. In my opinion, Rudy should have taken the money and ran, especially since his continued development may be stifled in Memphis with the addition of the ball-hogging Iverson. I think that ultimately, OJ Mayo and Zach Randolph will put up a ton of shots as well. The jury is out. What do you think? Let us know which player (Aldridge or Gay) will have the better career, and if Gay should have taken the money. Allen Moll is an avid NBA and College Basketball fan who watches and studies games religiously. He also coaches youth basketball in his native Lehigh Valley region of Pennsylvania. Allen is a regular columnist for thehoopdoctors.com, Bleacherreport.com, UpperDeckBlog.com, and his own blog, Hoops Haven (hoopsworld4.wordpress.com).